The Robinson R22 is a two-bladed, single-engine light utility helicopter manufactured by Robinson Helicopter Company. The two-seat R22 was designed in 1973 by Frank Robinson and has been in production since 1979. The majority of flight testing was performed at Zamperini Field in Torrance, California. Flight testing and certification was performed in the late 1970s by test pilot Joseph John "Tym" Tymczyszyn and the R22 received FAA certification in March 1979. Due to relatively low acquisition and operating costs, the R22 has been popular as a primary rotorcraft trainer around the world and as a livestock management tool on large ranches in North America and cattle stations in Australia. The R22 has a very low inertia rotor system and the control inputs are operated directly by push rods with no hydraulic assistance. Thus, the flight controls are very sensitive and require a light touch to avoid over correcting. A student that masters an R22 generally does not have a problem transitioning to a heavier helicopter. Due to the issues relating to a low inertia rotor system and a teetering main rotor, operation by any pilot in the United States of the Robinson R22 or Robinson R44 requires a special endorsement by a certified flight instructor. Tip weights were added to increase rotor inertia, but the small rotor limits weight. The R22 is a light, two-place, single reciprocating-engined helicopter with a semi-rigid two-bladed main rotor and a two-bladed tail rotor. The main rotor has a teetering hinge and two coning hinges. The tail rotor has only a teetering hinge. The normal production variant has skid landing gear. The Mariner version — which is no longer manufactured — provided floats. Wheeled gear is not available. The basic structure is welded chromoly steel tubing. The forward fuselage is made of fiberglass and aluminum with a Plexiglas canopy. The tailcone and vertical and horizontal stabilizers are aluminum. It has an enclosed cabin with side-by-side seating for a pilot and passenger. The doors may be removed for flight, as is often done for photographic flights, interior cooling in high temperatures, or a 10.4 lb weight saving. The first version was produced as the R22, followed by the R22 HP, R22 Alpha, R22 Beta, and R22 Beta II. Superficially, the aircraft appear similar. The R22 HP was fitted with a 160 bhp Lycoming O-320-B2C engine, an increase of 10 bhp (7.5 kW) over the original R22. The steel tube frame on the R22 Alpha was modified by extending the aft landing gear mounting points, giving the ship a slightly nose-down attitude on the ground and better matching of the skids to the ground in a low altitude hover with two people on board. The R22 Beta added an engine speed governor (optional), rotor brake, and auxiliary fuel tank (optional). The battery was moved from below the instrument cluster to the engine compartment for better balance. The R22 has been offered as an instrument trainer version, with optional fixed floats as the R22 Mariner, and other special configurations for police work, electronic news gathering, and so on. The R22 Beta II received a larger Lycoming O-360 engine de-rated for sea level operation. It allows greater altitudes for hovering in and out of ground effect (HIGE/HOGE). The R22 Beta II also made the engine speed governor standard and included a carburetor heat assist which correlates adding carburetor heat with decrease in collective control. Only the basic skid style is currently being sold. Instead of floor-mounted cyclic sticks between the pilot's knees, the R22 uses a unique teetering "T-Bar" control connected to a stick that emerges from the console between the seats. This makes it easier for occupants to enter and exit the cabin and reduces chances for injury in the event of a hard landing. The teetering bar has a hand grip on both sides that hangs down between the pilots' legs. Thus, if teetered to the right, the right side pilot would be flying and the left grip would be about 12 inches above the left pilot's lap. R22 flight instructors quickly learn how to fly with their hand in the air. The left part of the bar, left collective control, and left tail rotor pedals can be removed if the left seat occupant is not certified to fly the R22 or if the space is needed for technical or observer duties. A floor-mounted foot-activated push-to-talk switch facilitates intercom communications for the left seat occupant, although some later models may be equipped with a voice activated intercom system. The helicopter rotor system consists of a two-bladed main rotor and two-bladed anti-torque rotor on the tail, each equipped with a teetering hinge. The main rotor is also equipped with two coning hinges. Collective and cyclic pitch inputs to the main rotor are transmitted through pushrods and a conventional swashplate mechanism. Control inputs to the pre-coned tail rotor are transmitted through a single pushrod inside the aluminum tail cone. To ease the pilot's workload, a mechanical throttle correlator adjusts the throttle as the collective pitch control is raised or lowered. The pilot needs to make only small adjustments by twisting the throttle grip on the collective throughout the flight regime. Later models are also equipped with an electronic governor which works to maintain RPM within normal operating limits (between 97% and 104% RPM); the governor is active only when the engine is running above 80% RPM, and is most effective in normal flight conditions. The governor can be switched on or off with a toggle switch located at the end of the pilot's collective pitch control. When the governor is not engaged, a yellow caution light glows on the instrument panel. The R22 uses a horizontally mounted Lycoming O-320 (O-360-J2A on the Beta II), flat-four, air-cooled, normally aspirated, carburetor-equipped reciprocating engine. It is fueled with 100LL grade aviation gasoline. Cooling is provided through a direct drive squirrel-cage cooling fan. At sea level it is derated, or operated at less than maximum power, which has been attributed to the company wishing for the power unit to maintain the same performance at sea level as it does at altitude. As the air becomes thinner with increasing altitude, maximum available horsepower decreases, reaching a point where the throttle can be completely open and rotor RPM is controlled by collective lever position. By derating the engine at sea level, the R22 achieves acceptable high-altitude performance without use of supercharging or turbocharging, thus saving the weight, cost, complexity, unreliability, and shortened engine life of a forced induction system. A carburetor is used to provide the air-fuel mixture. Carbureted engines are susceptible to carburetor icing, a condition most likely to occur in conditions of a low 11 °C (20 °F) difference between the outside air temperature and dew point (the "dew point spread"), as well as visible signs of moisture in the atmosphere. Icing can lead to loss of engine power and, if not corrected, total shutdown of the engine. A carburetor heat control is used to supply heated air to the carburetor; this can prevent or cure icing, but also causes a reduction in engine power output because hot air is less dense, enriching the fuel-air mixture. The carburetor heat control is a simple plunger-type control mounted on the center console near the collective pitch control lever. Pulling the control up slides a gate valve near the carburetor that admits warm air from a scoop on the exhaust system. The R22 employs a carburetor air temperature gauge, marked to indicate temperatures conducive to icing. The Beta II version of the R22 also includes a "carburetor heat assist" which automatically applies carburetor heat when the collective lever is lowered below a certain point. When icing conditions are present, carburetor heat is required to prevent icing around the butterfly valve from the pressure drop at that point. As the carburetor air temperature (CAT) indicator does not read correctly below 18 in Hg (457 mm Hg) of intake manifold air pressure, icing conditions require applying full carburetor heat below 18 in Hg of manifold pressure. A placard indicating this requirement is located on the CAT indicator and in the Pilot's Operating Handbook (POH). Power is transmitted from the engine to the drive system through drive belts. Originally, the R22 used four separate v-belts running on multi-groove sheaves. This system proved problematic, as individual belts would sometimes roll over in their groove and fail. As a temporary measure, in 1982, R22 operators received a kit from Robinson that was installed in the cockpit and on the belt tension actuator, isolating the tensioning circuits and locking the clutch/drive system at take-off tension. The problem was ultimately solved by replacing the four individual v-belts with two dual v-belts. The upper, driven sheave is mounted on the main/tail rotor drive shaft incorporating flexible couplings, and is raised and lowered relative to the engine-mounted, driving sheave by means of a belt tension actuator. During shutdown, the actuator is used to lower the upper sheave to loosen the drive belts. For startup, the engine is started with the belts loose, allowing the engine to run without spinning the rotor system. Immediately after engine start, the clutch switch located in the cockpit is closed by the pilot, powering the actuator to slowly raise the upper sheave to flight position, which tightens the belts. The actuator is thereafter controlled by pressure-sensing column springs, automatically maintaining proper belt tension during flight as the belts wear and stretch. The shaft on which the upper sheave is mounted drives both the main and tail rotors; the main gear box delivers power to the main rotor shaft through a set of splash-lubricated spiral bevel gears. A one-way sprag clutch is built into the center of the upper sheave to allow the rotor system to continue to rotate in the event of engine failure, allowing the R22 to enter autorotation and land in a controlled manner. Because the main rotor has very little mass and inertia, autorotation in an R22 requires careful and proper execution to assure a successful outcome. Much time is spent in training practicing various types of autorotation. Target speed in an autorotation is 65 kn (120 km/h) and the glide ratio is approximately 4:1 in maximum-glide configuration. The two-bladed rotor and the small size of the R22 make it possible to transport the helicopter without blade folding or dismantling tasks. Transporting the R22 requires securing the tail boom and rotor blades to a truck or trailer bed, which must be torsionally rigid to prevent motion and stresses being applied to the helicopter during transportation. It is possible to take off from and land directly onto a trailer. Initial production version, powered by a Lycoming O-320-A2B or A2C piston engine. Higher-powered version, powered by a 160-bhp Lycoming O-320-B2C piston engine. Improved version certified in 1983, powered by a Lycoming O-320-B2C piston engine. Fitted with a more powerful engine, powered by a Lycoming O-320-B2C piston engine. Designed for off-shore work, fitted with floats and Lycoming O-320-B2C piston engine. Limited to daylight operations when fitted with floats. Designed for off-shore work, fitted with floats and Lycoming O-360-J2A piston engine. Limited to daylight operations when fitted with floats. Designed for IFR training with a larger 10-hole panel to accommodate additional instruments. Not IFR certified, so training must be done with a safety pilot in VFR conditions. The R22 is the basis for Boeing's Maverick military unmanned aerial vehicle helicopter, and its Renegade version. In 1999, Frontier Systems developed a remotely piloted R22, the Maverick. This aircraft, along with the company, was later acquired by Boeing Phantom Works. In 2003 the United States Navy purchased four aircraft, equipped with Wescam EO/IR (Electro-Optical/Infrared) systems. Boeing then modified one of the Mavericks further, calling it the Renegade, under contract with the Defense Advanced Research Projects Agency (DARPA) as a research testbed to develop software for its A160 Hummingbird. The software system, known as the Software Enabled Control (SEC) program, was developed by Boeing and teams from the University of California, Berkeley, Georgia Institute of Technology and Massachusetts Institute of Technology, and was first flown on May 26, 2005. During the flight, the SEC assumed control of the aircraft to "execute autonomous maneuvering algorithms". The software allows the aircraft to autonomously select "optimal routes through a field of pop-up and known threats; flying low-level, terrain-hugging profiles to avoid detection; and determining safe landing zones by using vision-based algorithms to process landing site imagery and terrain height information." The R22 is operated by many private individuals, companies, and flying clubs. In Australia, where there are 489 R22s registered as of mid-2011, a survey found that 62% of the fleet's flying time was in mustering operations, while 13% of hours were spent in training pilots. Many broadcasters used the R22 until the mid-1990s when the financial landscape of radio broadcasting in the U.S. changed due to deregulation of the industry. Since the R22 received FAA certification in March 1979, Robinson has delivered 4620 R22 helicopters. The R22 had 182 fatal accidents between March 1979 and June 2010 from a total of 1230 incidents. In late 1981, the R22 had its type certificate temporarily revoked by the Federal Aviation Administration due to delamination of a main rotor blade. The cause of the delamination was determined to be contamination of one of the bonded parts during a priming operation performed at an outside vendor. In response, Robinson Helicopter Company instituted stringent quality procedures and requirements, and replaced all main rotor blades on the fleet of 33 helicopters in service at the time. In the early 1980s, the R22 experienced a number of student-pilot related accidents due to the R22’s use as a primary flight trainer. Believing the number of accidents was the result of insufficient training and lax standards, Robinson established the Robinson Pilot Safety Course in 1982 to educate Certified Flight Instructors transitioning from larger helicopters to the new, smaller R22. After the introduction of the Robinson Pilot Safety Course, the rate of fatal R22 accidents declined from 3.7 per 100,000 flight hours in 1983 to 0.97 per 100,000 flight hours for the 12 months preceding July 1995. Robinson’s statistics show the rate of fatal R22 accidents per 100,000 flight hours fell from 6.0 in 1982 to 0.7 in 1997. As of 2012, more than 17,000 students have gone through the course. The R22 has a suggested retail price of $285,000 (ex factory price, USA) and the value on the second hand market is dependent on component time in service. Operating cost, per the factory, including insurance, reserve for overhaul, and direct operating cost (fuel, oil, inspections, unscheduled maintenance) is US$143.59/hr. A full overhaul of major components is required at 2200 hours (or 12 years, whichever comes first), which is sometimes known as "Timex"
The Robinson price list is updated in February each year. Data from Robinson R22 Pilot's Operating Handbook.Current versions of the R22 vary slightly. ^ Head, Elan (2015). "Expanded options". Vertical Magazine, Heli-Expo news. pp. 64–66. Archived from the original on 19 April 2015. Retrieved 11 April 2015. ^ "Aerospace Walk of Honor: "Tymczyszyn Bio"]". Archived from the original on 27 May 2014. Retrieved 1 April 2014. ^ Greenspun, Philip. "2005 Robinson R22 - owner's review" March 2010. Accessed: 20 September 2014. ^ Borrows, David A. Rotor RPM Flight Training, March 1998. Accessed: February 2011. ^ a b Robinson Helicopter Company (1996-10-22). R22 Pilot’s Operating Handbook and FAA Approved Rotorcraft Flight Manual. pp. 2–2, 7–17. ^ Robinson Helicopter Company - R22 Maintenance Manual and Instructions for Continued Airworthiness - RTR 060 Volume 1 (PDF). Oct 2014. p. 1.20. Archived from the original (PDF) on 4 March 2016. Retrieved 1 January 2016. ^ "Boeing Completes Successful Autonomous Flight Control Technology Program". Space Daily. March 20, 2006. ^ Marchbank, Margo, ed. (July–August 2011). "Stockhorse of the sky: the Robinson R22". Flight Safety Australia. Civil Aviation Safety Authority (81): 14–15. ISSN 1325-5002. ^ "Dominican Rep. Army Aviation". Retrieved 10 January 2013. ^ "Robinson R-22 Beta II". Retrieved 10 January 2013. ^ "Philippine Navy". Archived from the original on 15 November 2012. Retrieved 10 January 2013. ^ Ells, Steven W. (2007, June 1) The highest standards: Robinson Helicopter aims for excellence. AOPA Pilot. ^ Campbell, J.R. "Zoom". (1995, October) Witch hunt extraordinaire. US Aviator 8-16. ^ Robinson Helicopter Company. (2012, Spring). Robinson safety class turns thirty. Robinson News, Volume 18, Issue 1, p. 3. ^ "R22 Pricelist" (PDF). Robinson Helicopter Company. Archived from the original (PDF) on 9 March 2013. Retrieved 1 January 2016. ^ a b c "R22 Operating Costs" (PDF). Robinson Helicopter Company. Archived from the original (PDF) on 10 June 2014. Retrieved 23 May 2014. ^ "R22 Introduction and Specifications". Robinson Helicopter Company. 2017. Retrieved June 14, 2017. 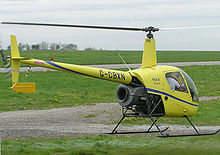 Wikimedia Commons has media related to Robinson R22. This page was last edited on 2 February 2019, at 04:59 (UTC).